As someone who has trained for the most part of his life in his own home gym, I know very well how frustrating it can be at times to build maximal strength in the absence of some very basic equipment. My home gym has always consisted of very few equipment, namely barbells, dumbbell, some weight plates, a wooden bench, and in the last year I have added some kettlebells. Exercises like heavy back squats, heavy benches were not possible to do in my home, since I do not have a squat rack, nor a sturdy iron bench. This is why I have rejoined a public gym and train there once a week to get in some heavy bench presses, deadlifts and squats. However I have spent and still do spend most of my training time in my own home gym. In this article I will share with you how to optimize strength training in a home gym when you have very few tools to use. First of all when we talk about strength training, the best exercises are deadlifts, rows, presses, pull ups, dips, lunges, etc. Basically mostly heavy compound exercises. Some of these exercises like rows, dumbbell lunges, etc can be done without a need for equipments like racks, or spotters, etc. You can do them alone with complete safety, but what about exercises like the back squats? Unless you have a squat rack or stands you cannot lift very heavy weights, because you will not be able to clean that much weight and place it on your back in the first place. And even if you were to put a pretty heavy weight on your back, still training alone can be dangerous if you get stuck with the weight on your back. The same thing applies to bench pressing, firstly when training alone it will be a challenge to get the heavy bar to the staring position, and then if you get stuck with the bar on the body it will be a challenge to safely get the bar off your chest. And what if you do not even have a bench? So let me share with you 3 alternative exercises for 3 basic lifts that you can do in your own home gym if you have nothing but some barbells, dumbbells, and weight plates. Yes, so that means no benches, no racks, nothing beyond the very basic. By the way do remember that there was a time when the oldtime strongmen too trained and got very strong in the absence of racks and benches, so its not an impossible task. If you cannot get the bar all the way to your back, then you can atelast support it in your arms and squat.While you may not be able to go as heavy as the back squat, you will still be able to go heavier than most other forms of squats that you can do with only the bar and no rack. In the video below you can see how to do it. First deadlift the weight onto your thighs and then rest it there. Next place the bar in your arms, and finally squat. One thing that I will advise is to keep the reps low, preferably no more than 6 reps when you go heavy. 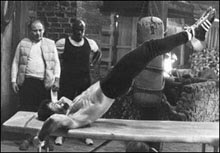 If you want to do high reps, then you will probably be using moderate to light weights, in which case I think you can place the bar on your back, and do not need to do it Zerker style. If you have a heavy Olympic bar and enough weights, then the basic two hand version is great, but if you do not have an Olympic bar, then you will not be able to go very heavy. The average regular bar will probably be able to hold upto 300 pounds and not more, and even then it will probably start bending. So once you gain enough strength to lift 300 pounds or as much as your bar can support, you will find it hard to add more weight with the regular bar. Buying an Olympic bar is certainly an option, but can be pricey. Firstly you will have to pay for the bar, and next you will need to get a completely new set of weight plates, since you cannot use the plates of the old bar for the new Olympic one. If your budget allows it then do surely get an Olympic bar, but what if you are on a tight budget? Then the best solution for you will be 1 hand deadlifts. Thus if you have progressed upto say 250 pounds and feel that the bar will not be able to take heavier weights, then simply start lifting with one hand. You will immediately be forced to use much lesser weights, and work your way up. While this may not necessarily work your lower body that much harder, your grip strength will surely improve like crazy. Probably the most loved exercise in most gyms across the world, but one that needs a bench and a spotter to do it safely. So when you train at home minus a bench, the floor press is your best alternative, and to make it safe the 1 arm dumbbell version is the best way to go. With the 1 arm dumbbell version, you have much greater control, and can spot yourself. While the floor presses may not stimulate as much pectoral growth as the full range bench press does, it certainly will develop a ton of pressing power, and considering the dangerous bench press form of most trainees, it may actually be a lot safer for your shoulders to floor press.